We are handled Film Constellation’s social media strategy at the Venice Film Festival 2016. The newly launched UK-based sales company managed international sales of David Lynch The Art Life – third documentary in a series of cinematic portraits examining Lynch’s early years and multifarious influences. Directed by Jon Nguyen, the film was shot over four years during more than 20 conversations recorded in Lynch’s own home including at his painting studio in the Hollywood hills. The main axe of the social media campaign was a set of top-notch contents that are released exclusively by Premier Comms through key media partners. The film generated dream engagement, unanimous press and secured key international sales in Venice. 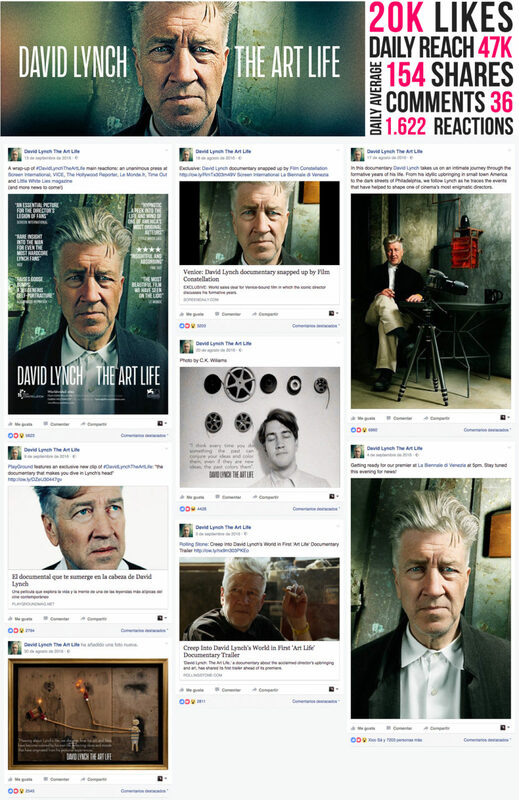 David Lynch: The Art Life, recorded high reach engagement with more than 70K Facebook Likes as well as unanimous positive press through amazing reviews in Variety, Hollywood reporter, Screen, Vice, Le Monde and Little White Lies among other key media. David Lynch documentary has been acquired by Amazon & Junius (US), Soda Pictures (UK), Wanted Cinema (Italy), Potemkine (France), NFP (Germany), Vertigo (Spain), Angel Films (Scandinavia) among other key territories announced exclusively by Variety.